Bognor boss Jack Pearce has praised the work ethic of his young squad as their good start to the season continues. After six matches unbeaten in the league, which has lifted them to third in the Bostik Premier, the Rocks took their good form into the FA Cup last weekend. Goals from Jimmy Muitt (2), Brad Lethbridge, Dan Smith and Mason Walsh secured a comfortable victory over Whitstable Town in the first qualifying round of the competition. 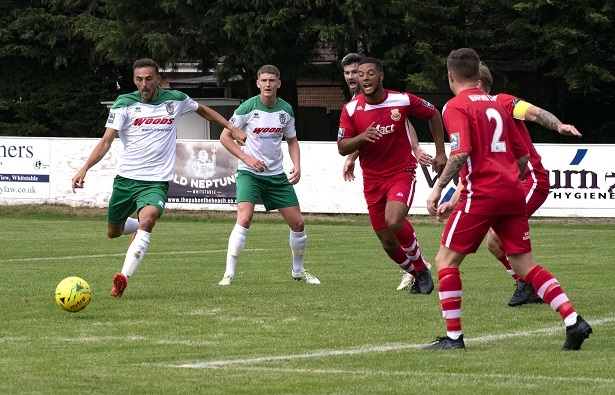 The victory secured Bognor a minimum of £6,000 prize money and also sets up a tie with Bostik North side AFC Sudbury at home on September 22. Before then, though, Rocks return to league action with a trip to Carshalton Athletic tomorrow (3pm). Then, it is league cup action as the Velocity Trophy throws up a home match against Sussex rivals and fellow Bostik Premier side Whitehawk on Tuesday (7.45pm). Pearce, though, believes the morale-boosting win in the cup will set his young side up well for the challenges to come. He said: “Any good win by five clear goals away from home in the FA Cup, especially when their goalkeeper was man of the match, cannot be bad. “When you start winning a few games the players get more confidence in their ability and that can lead to better performances and results. “Their attitude from the start of the season towards hard work – which is what matters in football – has been excellent. “In our situation it’s good to have a young hungry side that wants to improve. “We still have a few Achilles heels to work on – we’re giving away opportunities which are not down to opponents’ good play but more down to our sloppy play. Bognor’s opponents tomorrow, Carshalton, have made a solid start to the new season. The south London side have taken eight points from their opening five matches which means they sit 10th in the 22-team division. With one of the best defensive records in the league, Bognor will need to be at their creative best to break down their defence. Pearce said: “I watched Carshalton very recently when I saw them play Worthing and they lost 2-1. It was a very tight game which they could have taken something from and I expect another tight one there tomorrow. “We will create chances and it’s just a case of taking some of them and making sure we keep it tight at the back.